Catalog, a Boston, MA–based developer of commercially viable DNA data storage, raised $9M in funding. The round was led by New Enterprise Associates (NEA) with participation from OS Fund, Day One Ventures, Line, Data Collective, Green Bay Ventures, AME Cloud Ventures, Industry Ventures, and others. 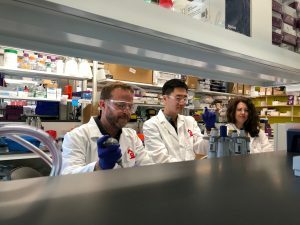 Founded by MIT scientists Hyunjun Park, CEO, and Nathaniel Roquet, and based in the Harvard Life Lab, and also led by Devin Leake, Chief Science Officer, Catalog has developed a solution to make DNA data storage commercially viable. The first generation of the company’s commercial product will use an online interface for customers. Catalog will handle writing the data into DNA using the company’s machine. Once written into DNA, the data can be stored either by the company or at the customer’s own facility (in a commercial refrigerator), such as those found in restaurant kitchens. It is focusing its first commercial pilots on organizations in government (including intelligence and space), IT, entertainment, and other sectors. While developing the technology, the team consulted with Eric Shaqfeh, Stanford University’s Lester Levi Carter Professor and Department Chair of Chemical Engineering, and David Weitz, Harvard University’s Director of the Materials Research Science and Engineering Center.